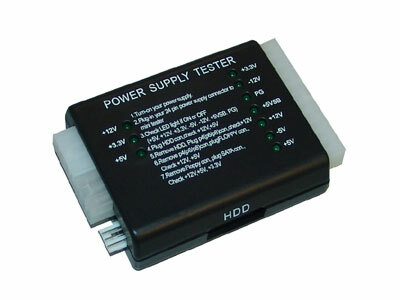 Features: This product is a simple tester for switching power supply. It makes it easy to test the power supply output. 1. Turn-on your power supply. 2. Plug-in your 24-pin or 20-pin power supply connector to mini tester 3. Check LED light it ON or OFF (+5V. +12V. +3.3V. -5V. -12V. +5VBS. PG) - If the power output is working, the LED will light and you will hear a sound - If the power output fails, you won't see the LED light & no sound 4. Plug the HDD con, check +12V, +5V 5. Remove HDD, Plug p4(p6/p8)con, check +12V 6. Remove p4(p6/p8)con, plug FLOPPY con, check +12V, +5V 7. Remove Floppy con, plug SATA con, check +12V, +5V, +3.3V 8. Do not plug wrong position when you use P4 connector 24-pin Power Connector Power HDD Connector Power P4 Connector Power Floppy Connector Warning: This product is designed only for power supply output tests. Do not leave it connected to the power supply unattended. It generates heat and could possibly damage your power supply. This product is a simple tester for switching power supply. It makes it easy to test the power supply output. 1. Turn-on your power supply.